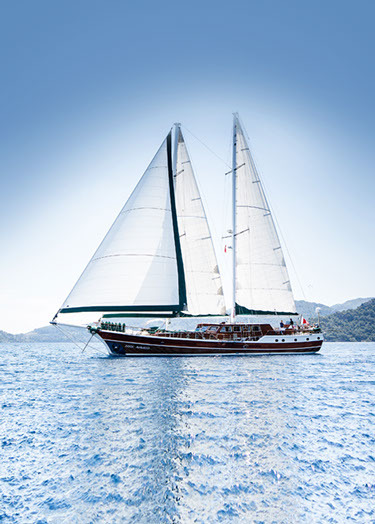 Built and launched in 1997, Ecce Navigo was designed to offer the comfort and charm of a traditional gulet with high performance rig and sails for a superior sailing experience. Moored in Gocek for most of the year, up to 10 guests will be thoroughly spoilt aboard this stunning vessel while touring Turkey and the Greek islands by private charter.Highlife completed a six month project to launch Ecce Navigo into the UK market and successfully got her featured with, amongst others, Elegant Resorts, Azure, ITC Classics and Carrier. Even in instances where the operator did not already have a yacht programme in place. This was a thoroughly enjoyable and educational project as we had never worked in Turkey before. We came to appreciate the beauty and allure of this undervalued country and relished the uniqueness of Ecce Navigo, providing the trade with something very special to offer high net worth clientele.